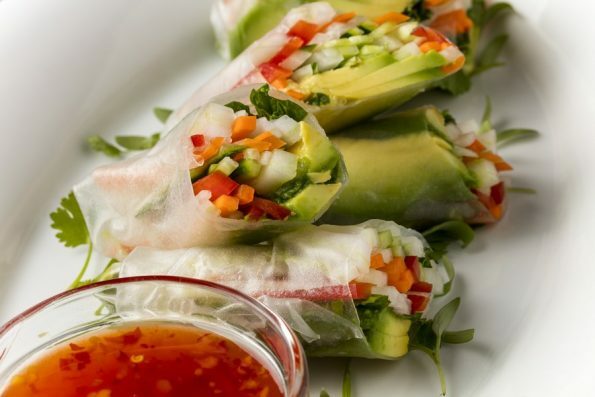 As a starter, go for the Vegetable Summer Roll ($11), filled with crunchy vegetables, avocado, and mint, served with a sweet chili sauce, or the Vegetable Crudité ($12) featuring fresh vegetables and housemade green goddess dressing. For those who enjoy soup year-round, Paul Martin’s has two summer-worthy options. The Hot Pot Vegetable ($8) is highlighted by cilantro, ginger broth, and fresh jalapeno, and the Chicken Tortilla ($9) is served with avocado-poblano salsa, crispy tortillas, and cilantro. The lunch and dinner menus now showcase two hearty vegetarian entrées. The Warm Quinoa Bowl ($12 lunch/$14 dinner) is topped with savoy spinach, blistered tomato relish, mushrooms and seasonal vegetables. A Mesquite Grilled Poblano Chile Relleno ($15 lunch/$17 dinner) is stuffed with vegetables and cheese and topped with a roasted red pepper cream sauce. For dinner, enjoy the Grilled Mahi ($28) with baby bok choy, blistered tomato relish, and lemon. Add on a seasonal veggie side dish to any entrée for $6. Choose from Grilled Baby Bok Choy with lemon and olive oil, Sugar Snaps Peas with shitake, ginger and garlic, or Elote Corn on the Cobb, topped with chili aioli and cotija cheese. To complement the summer dishes, two thirst quenching cocktails, both available for $13, have been added to the bar menu. The Corralejo Strawberry Splash is shaken with strawberry infused Corralejo Blanco tequila, Cointreau liqeur, muddled strawberries, fresh lemon juice, and housemade cane syrup. The Cucumber Refresher is a mix of Effen Cucumber vodka, St. Germaine Elderflower liqueur, muddled cucumber, basil, and fresh lemon juice, topped with soda water. The concept behind Paul Martin’s® focuses on “Seasonal & Delicious”, which was developed for the first restaurant in Roseville, Calif. where relationships were forged with innovative local farmers and purveyors of artisanal foods. The company now has additional locations in El Segundo, Irvine, Mountain View, Rancho Cucamonga, San Mateo, Westlake Village, Calif., Dallas, Texas, and Scottsdale, Ariz. For more information, visit paulmartinsamericangrill.com.